Our year round Best Seller. Red and White Wine or even a touch of fizz from the Prosecco are great accompaniments to the selection of our renowned Pork Pies along with smooth and creamy local Blue Stilton and Rutland Red Cheese and Chutney. Our thick Pork Sausages are ideal for all occasions be it breakfast, lunch, dinner and of course the BBQ. 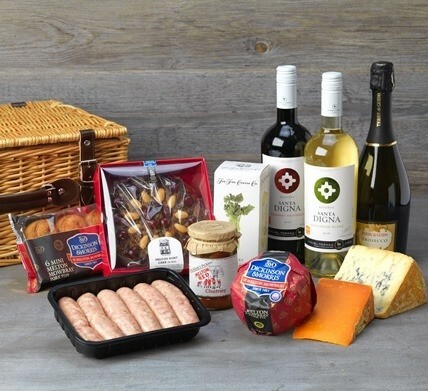 This Luxury Hamper comes in two parts: An impressive wicker basket with the perishable items packed separately in an insulated box to keep them chilled. Please note: since this hamper contains alcohol so you must be at least 18 years of age to purchase. Large Pork Pie (454g), 6 Mini Pork Pies (300g), Wedge Blue Stilton Cheese (454g), Wedge Rutland Red Cheese (200g), Melton Red Chutney (280g), Walnut, Honey & Olive Oil Crackers (125g), Fair Trade Santa Digna Cabernet Sauvignon (75cl), Fair Trade Santa Digna Sauvignon Blanc (75cl), Prosecco (75cl), Dickinson & Morris Thick Pork Sausages (454g), Melton Hunt Cake (907g).